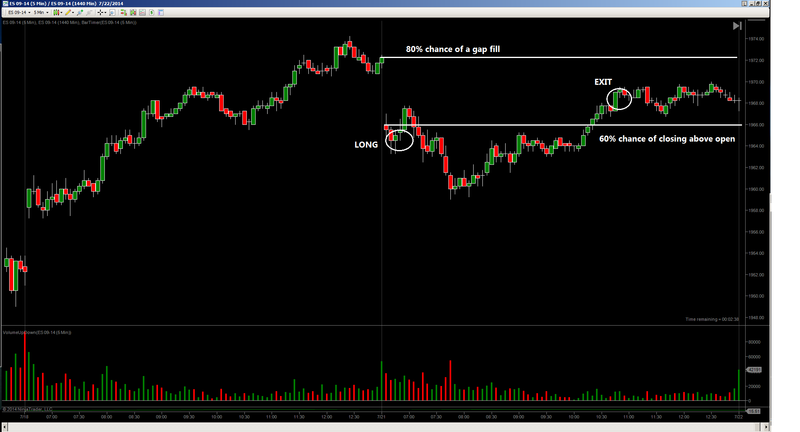 Stats for the day were bullish, high chance of gap fill and closing above the open. I entered long a few minutes after ES open and experienced a pretty big draw down (comparable to my profits). I was still confident in the trade. Even if the market did not fill the gap, it should close above the open. I would normally hold for the entire gap fill, however, because ES dropped so much (compared to the average range), I thought it would be difficult for the market to rally much further. In my experience, complete reversals are not that common. As you can see, my extincts proved accurate for the day as the market essentially closed where I cut. This trade honestly had a terrible entry, I’ll try to do better next time.